Figural barrel advertising bottle for Theodore Netter of 1215 Market Street, Philadelphia, Pennsylvania. Circa 1890's, often listed as a whiskey, but possibly rum. Reads "Greeting" above name, while the 2nd "1" in the address is reversed. 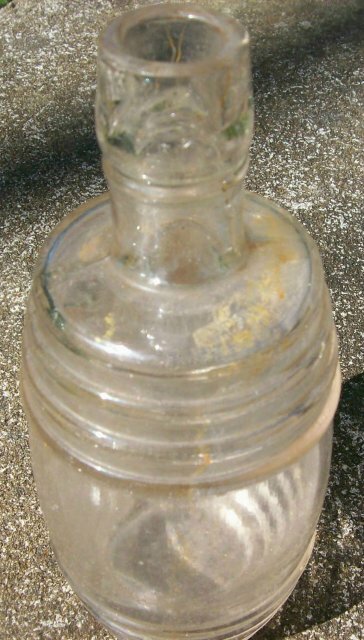 Clear glass with inclusions and minor imperfections; could use a good cleaning. Measures 5.75"h. Has a minor rough spot on lip, where extra glass has been chipped away. Sold as is. Inglenook Antiques...Established 1989. Items Similar To "Figural Barrel Advertising Bottle Theodore Netter Philadelphia 18..."